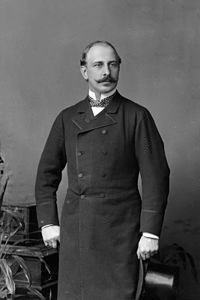 Francis, Duke of Teck GCB GCVO (Francis Paul Charles Louis Alexander; 28 August 1837 – 21 January 1900), known as Count Francis von Hohenstein until 1863, was an Austrian-born nobleman who married into the British royal family. He was the father of Queen Mary, and thus a great-grandfather of the current British monarch, Queen Elizabeth II. Francis held the Austrian title of Count of Hohenstein (Graf von Hohenstein), and the German titles of Prince (Fürst) and later Duke of Teck (Herzog von Teck), and was given the style of Serene Highness in 1863. He was granted the British style of Highness in 1887. Francis was born on 28 August 1837 in Esseg, Slavonia (now Osijek, Croatia), and christened Franz Paul Karl Ludwig Alexander. His father was Duke Alexander of Württemberg, the son of Duke Louis of Württemberg. His mother was Countess Claudine Rhédey von Kis-Rhéde. 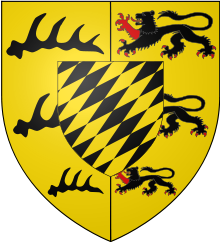 The marriage was morganatic, meaning that Francis had no succession rights to the Kingdom of Württemberg. His title at birth was Count Francis von Hohenstein, after his mother was created Countess von Hohenstein in her own right by Emperor Ferdinand I of Austria. He was educated at the Imperial Austrian Academy of Engineers from 1849 to 1853 and joined the Imperial Austrian Army as a lieutenant in the 1st Lancers in 1854. He transferred to the Guard Squadron in 1858 and later became a Captain (Rittmeister) in the 7th Hussars. He served as Orderly Officer under Count von Wimpffen in Italy during the Austro-Sardinian War and was awarded the gold medal for distinguished service at the Battle of Solferino and the bronze war medal, 1859. In 1863, Francis was created Prince of Teck, with the style of Serene Highness, in the Kingdom of Württemberg. He served during the Austro-Prussian War and retired from the Austrian Army when he married and moved to England in 1866. As the product of a morganatic marriage, and without succession rights to the throne, Francis was not acceptable as a husband for princesses in most of the European royal houses. He further had little income in comparison with other European princes. He thus married into a richer family, by marrying his father's third cousin (in descent from King George II of Great Britain) Princess Mary Adelaide of Cambridge, the younger daughter of Prince Adolphus, Duke of Cambridge, and a granddaughter of George III, who was known as 'Fat Mary' because of her wide girth. Princess Victoria Mary of Teck (1867–1953); later Queen Mary, Queen-Consort of the United Kingdom. He was created Duke of Teck by the King of Württemberg in 1871. Teck was made Honorary Colonel of the 1st City of London Artillery in 1867 and Honorary Colonel of 49th Middlesex Rifle Volunteers (Post Office Rifles) on 16 August 1876. He was attached to the staff of British General Sir Garnet Wolseley during the Egyptian campaign of 1882. He received the silver medal for the Battle of Tel-el-Kebir, the Khedive's Star, and the Order of Osmanieh, first class. On his return from Egypt he was gazetted a Colonel in the British Army. The Duke of Teck was made Colonel (Oberst) à la suite of the 25th (1st Württemberg) Dragoons "Queen Olga" on 6 March 1889, and a Generalmajor in the German Army on 18 October 1891. He was made a supernumerary Major-General in the British Army in July 1893 and a Generalleutnant in the German Army on 18 April 1895. Because Francis had no inheritance, the couple lived on Mary Adelaide's Parliamentary allowance of £5,000 per annum (equivalent to ca. £525,000 in 2013), supplemented by income from her mother, the Duchess of Cambridge. Mary Adelaide's requests to her cousin, Queen Victoria, for more funds were met with refusal; however, they were granted a grace-and-favour apartment in Kensington Palace, London and a country house, White Lodge, the former Royal deer-hunting lodge in Richmond Park, Southwest London. The Duke and Duchess lived beyond their means, leading to the build-up of large debts. In 1883, the Tecks fled the UK to continental Europe, where they stayed with relatives in Florence and Germany. They eventually returned to the UK in 1885. With an Order in Council on 1 July 1887, Queen Victoria granted Francis the style of Highness, as a gift to celebrate her Golden Jubilee. Despite this, the Tecks were still seen as minor relatives, with little status or wealth. Their fortunes improved when their only daughter, Princess Victoria Mary of Teck (known as May to her family) became engaged to the second-in-line to the British throne, Prince Albert Victor, Duke of Clarence. There was initial opposition to the match from the Duke of Clarence's parents, the Prince and Princess of Wales: Arthur Balfour wrote to Lord Salisbury in 1890 that "(t)he Teck girl they won't have because they hate Teck and because the vision of Princess Mary haunting Marlborough House makes the Prince of Wales ill." Nevertheless, the Queen gave her official consent to the engagement on 12 December 1891. The death of the Duke of Clarence only six weeks later looked like a cruel blow. However, Princess May consented when the Duke of Clarence's brother (and next in the line of succession), Prince George, Duke of York, proposed to her instead. In 1897, the Duchess of Teck died, leaving Francis a widower. He continued to live at White Lodge, Richmond, but did not carry out any Royal duties. In Who's Who, the Duke of Teck listed his recreations as "a little of all". He was President of the Royal Botanic Society and a member of numerous clubs, including White's, the Marlborough Club, the Bachelors' Club, the Army and Navy Club, the United Service Club, the Cavalry Club, the Naval and Military Club, the Travellers' Club, the St George's Club, the Hurlingham Club, the Ranelagh Club and the Jockey Club, as well as the Adels-Casino at Vienna and the Herren-Casino at Stuttgart. The Duke of Teck died on 21 January 1900 at White Lodge. He was buried next to his wife in the Royal Vault at St. George's Chapel, Windsor. There is a pub in Earls Court, London, called the Prince of Teck. Arms of Francis, Duke of Teck . ^ James Pope-Hennessy, Queen Mary, Reprint Society 1959, p 61. ^ "No. 26417". The London Gazette. 15 August 1876. p. 3714. ^ "Bank of England Inflation Calculator". Bank of England. Bank of England. Retrieved 27 November 2014. ^ "No. 26233". The London Gazette. 15 December 1891. p. 6911. ^ Maclagan, Michael; Louda, Jiří (1999). Line of Succession: Heraldry of the Royal Families of Europe. London: Little, Brown & Co. p. 30. ISBN 1-85605-469-1. ^ "No. 23134". The London Gazette. 26 July 1866. p. 3871. This page was last edited on 26 February 2019, at 23:26 (UTC).